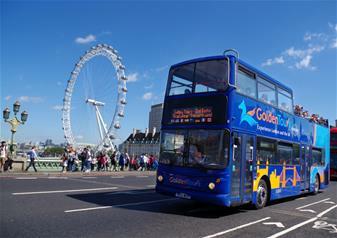 Explore the very best that London has to offer onboard our open top bus tour. There’s no better way to soak in the iconic sights of the capital’s most famous landmarks and locations than on the top deck of our buses and that’s not all. This flexible, open-dated ticket allows you to take the tour whenever you want to so we work around your schedule! There’s no guessing why London is known as one of the most wonderful cities in the world. From the 17th century St Paul’s Cathedral to the formidable Tower of London, London is bursting at the seams with history and beauty in equal measure and you’ll get to see it all. Get up close to the golden gates of Buckingham Palace, see the historic Westminster Abbey, pass the iconic London Eye, view the tremendous Shard skyscraper and many more. As you’re driven through the heart of London, past the illuminations of Piccadilly Circus, through the hustle and bustle of the city’s thriving West End, through the famous Trafalgar Square and many more of these must-see locations, you’ll get to uncover London’s rich and fascinating history. With onboard audio guides telling you the city’s past, you’ll get to have your own time travelling adventure of your own. If you’re on the Essential Route, you’ll be treated to a live English-speaking guide who will reveal the story and secrets behind each location. This open-dated bus ticket doesn’t just give you the freedom to choose when your open top tour is, you have the freedom to hop-on and off as many times as you wish for 24 hours. Take advantage of the 4 routes and over 60 stops on offer and go explore London for yourself. Test out the Whispering Gallery in St Paul’s Cathedral, discover Poet’s Corner at Westminster Abbey, soak in the View from the Shard, take a selfie or two at Madame Tussauds, enjoy a flight on the London Eye or simply stay on our city tour for the best sightseeing experience in the capital! Alongside your open top bus tour London, you can enjoy an enthralling sightseeing cruise along the heart of London’s River Thames with this hop-on hop-off boat ride. Departing from Westminster and taking you to St Katharine’s Pier, you’ll get to soak in panoramic views of the capital’s most iconic landmarks for a sightseeing experience like no other! Discover fascinating facts as you cruise with live commentary from the captain and audio guides available via your Smartphone in Spanish, Chinese, English, French, German and Italian. Tickets are valid for 24 hours (unlimited usage within this time) so you can see the best of London at your own leisure!